My husband’s uncle died in World War II. My uncle served, but returned. My hus­band, broth­er, broth­er-in-law, and so many oth­ers we knew served in Korea, some my hus­band knew nev­er returned. And there have been oth­er bat­tles since then. Now, with­out the draft, it seems the same small per­cent­age of Amer­i­cans vol­un­teer to take on our bat­tles over and over, with each per­son return­ing to the front (wher­ev­er it is) repeat­ed­ly. No more is it the two or four year block of life removed from the draftee or vol­un­teer as in Korea. Or “the dura­tion” as in WW II. Now it seems a life-style of the select few. Which leaves a large por­tion of our cit­i­zens uncon­cerned about those fight­ing for free­dom around the world. Indeed, many of the young gen­er­a­tion seem unaware of the exis­tence of the rest of the world, except as a pos­si­ble place to vaca­tion. I planned to see beau­ty in this day, but some­how, I’ve missed the con­nec­tion. Oh, there is beau­ty. 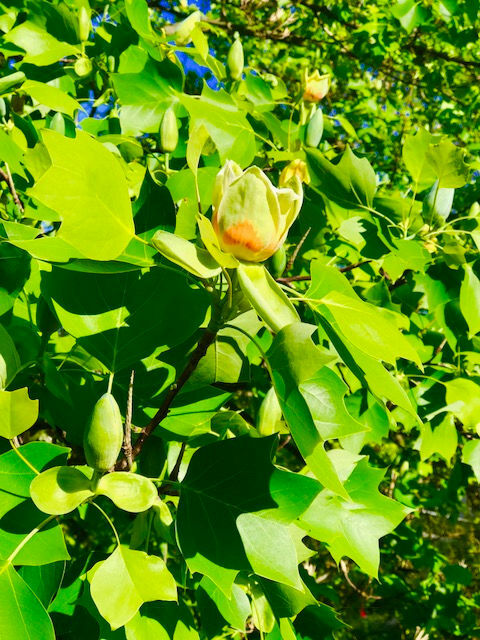 Our tulip poplar tree in bloom. Pic­tures of our great-grand-chil­dren on Face­book. The orange I had for lunch. (Love­ly taste, too.) Most com­ments about this day might dis­play a flag or a mil­i­tary salute to vet­er­ans. I could do that as well, and it would be mean­ing­ful to me. But I’ll break with tra­di­tion and post the tree blos­som. Just for a moment, I’ll think beau­ty. But in the back of my thoughts will be that flag, those vet­er­ans, and why can’t it be dif­fer­ent? Tomor­row, per­haps the sun will come out, and life will go on as before, as it did yes­ter­day.